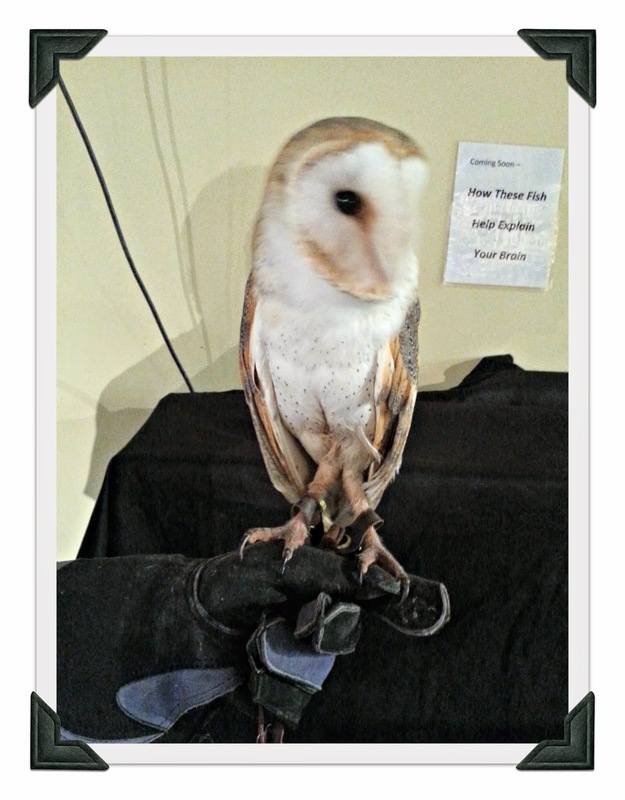 I love barn owls. There's an owl that lives near my parents' house. Sometimes we hear it hoot in the evening. We took Liv to a program like that at the University of Iowa a few months ago. We thought it was interesting how owls' feathers cut through the air soundlessly but other raptor feathers/wings are more noticeable. I don't, but the boys are so cute and growing up! Just had to stop by to check. What fun, I am glad you went! 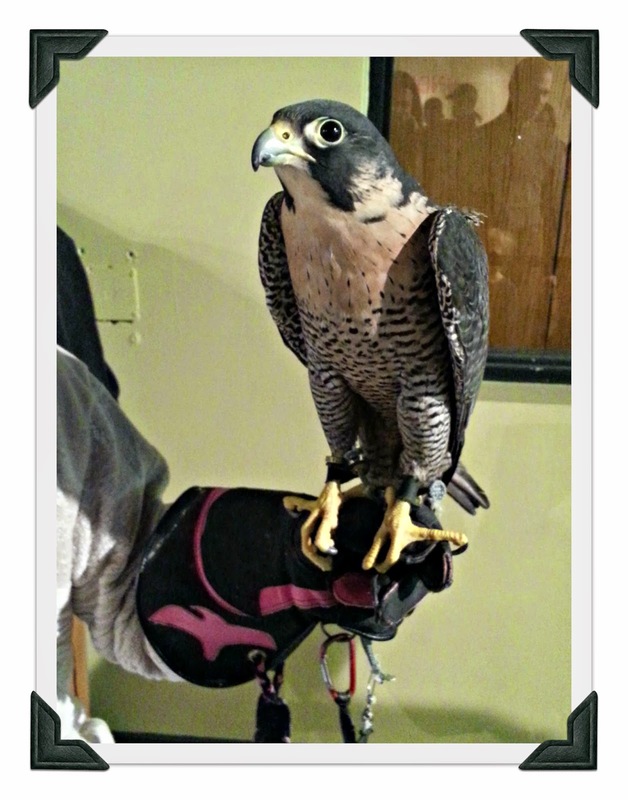 I have been to a raptor show and they are awesome. I don't think I have seen a barn owl, though. They are strangely beautiful and ghostly. The peregrine's eyes are too big for his head size, all the better to spot his prey. WOW I'd like to see that owl in person. I think the way they move their heads is so cool! Mica had an obsession with peacocks when he was 3 and 4. For awhile I collected some peacock things because I knew he liked them. I have some ornaments with peacock feather designs on them. My little Ellie loves owls. We did something like this once and she was enthralled. Great experience for littles. What a wonderful time! Great pictures too! What a great visit for the boys. My fav would have to be the bald eagle. I've seen a few out in my travels to some very remote places in Va. I am reading a lot about raptors learning better identity guides for them. I like to watch them all. I have worked on a falcon and osprey projects with the state. Of course I do like eagles, they are in a class by themselves. I just finished a book on Hawk Ridge, an area in MN that has a good amount migrating each year. very cool! I remember birds being brought to my school when I was very young. 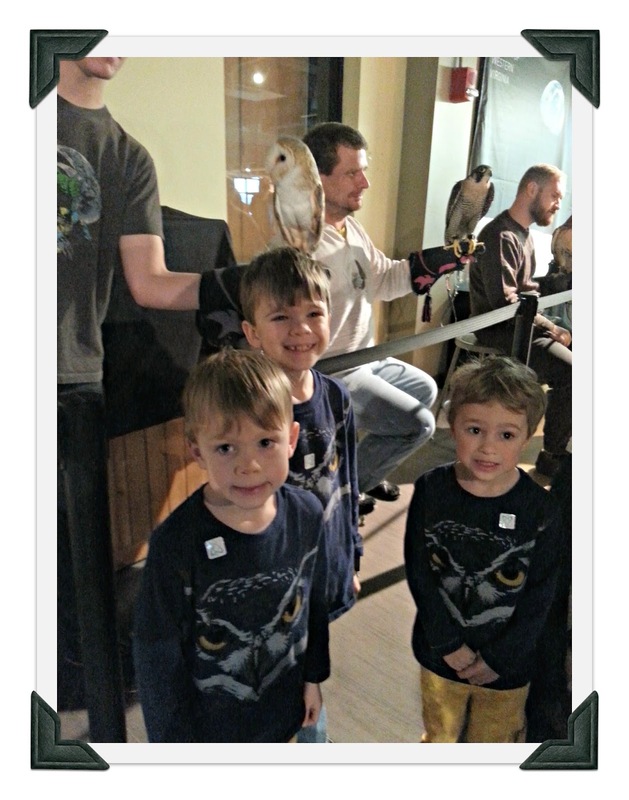 LOVE those Owl shirts and happy faces! You're always doing something fun and educational with your boys. Would that a few more parents were like that! My mother in law was a big bird watcher. She knew all the hawks here in the mountains. These days I see the hawks in trees or on power lines and I remember how much Ruby enjoyed them. Dat zijn hele overwinningen om er eentje op je arm te nemen. I hope you dressed for the occasion also. I want to pet the owl too..
Great falcon picture! And it's great that the boys got to experience this. Haven't stopped by for awhile to see you , and my how your boys are growing. Such wonderful smiles. I dont have any favorite yet. I like to see the bird demonstrations. Looks like your little ones did have a great time! Blue Jays are a reminder for me that Spring is around the corner. So, I'll go with Blue Jays (given my limited knowledge of birds). It's been a while!